I like to repurpose material whenever I can, and I’m always wanting a fast easy way to start a fire. 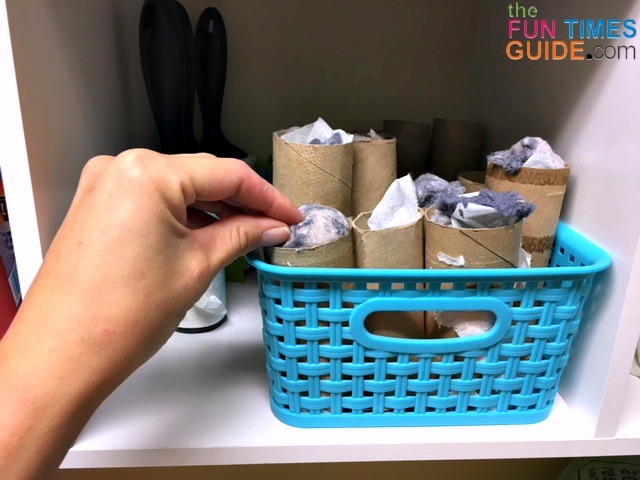 I’m not sure where I got the idea for this simple DIY fire starter, but it’s a good way to repurpose dryer lint and toilet paper cardboard tubes. Plus, these dryer lint fire starters work really well! We have a good-sized fire pit in our backyard — which is super helpful when it comes to living on a 1/2-acre property. My mom and I built our Neolithic fire pit the day before my son was born. 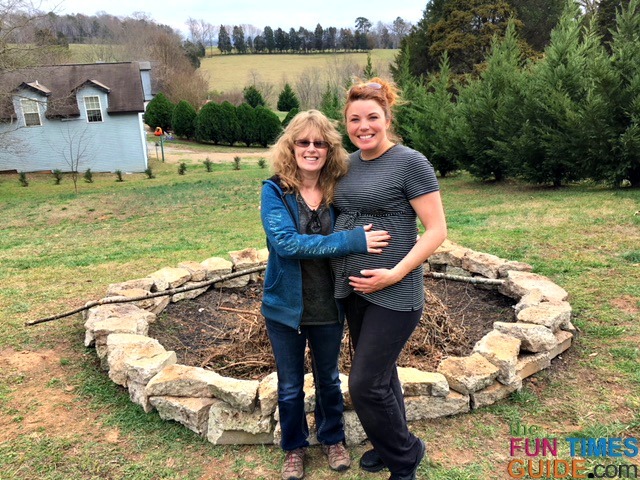 Because I went to 42 weeks and so desperately wanted a natural birth, I was literally trying to induce labor by moving these massive, busted concrete blocks while building the perimeter of the fire pit walls. Since then, the fire pit has been scaled back to about half of its gargantuan original size. 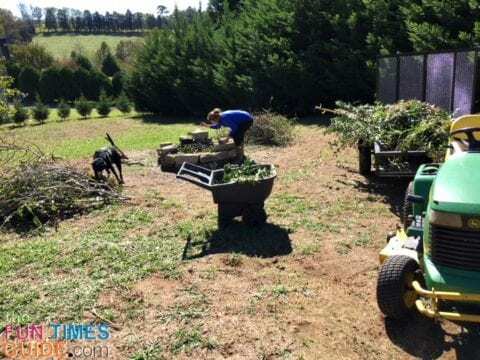 Our yard produces massive amounts of natural materials (branches, leaves, pine needles, foliage trimmings, etc.) which require disposal of some kind. Our property is literally lined with a variety of trees, and we also have several flower beds in the front yard — all of which require trimming, weeding, transplanting, etc. Owning a property this size requires constant maintenance and having the fire pit allows us to burn all of the yard debris. I needed a way to get a fire started fast whenever it came time to get some yard work done. This DIY fire starter makes the process super easy! I keep a small basket on a shelf in my laundry room to collect the cardboard tubes from empty rolls of toilet paper and paper towels. After each load of laundry, I continue to fill these tubes with used dryer sheets and lint from the dryer lint catcher. Once I have a dozen tubes filled, I will complete the batch with the following steps. 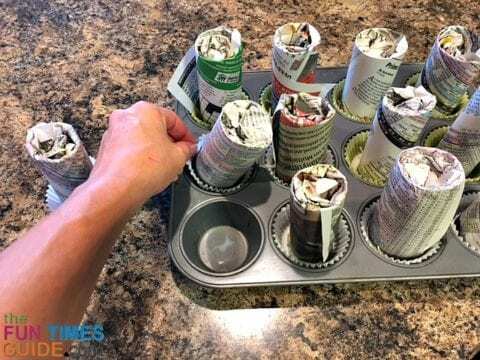 Place cupcake liners into a cupcake tin pan, and preheat the oven to 300 degrees Fahrenheit. Remove the tealight candles from their tin liners, then place 1 candle (wax and wick) in each cupcake liner. 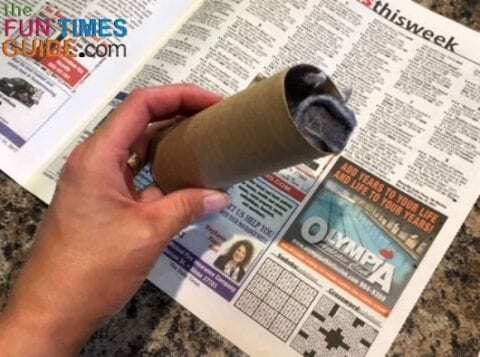 Roll the stuffed tubes in a sheet of newspaper. 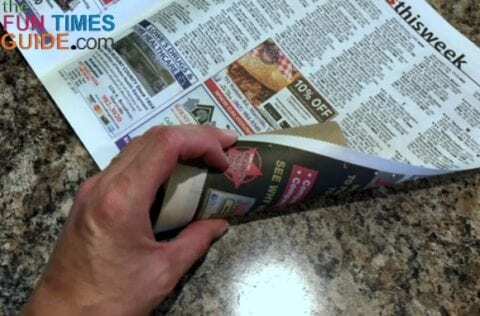 Stuff the excess newspaper into both ends of each tube. By this time, the wax is usually melted. Bring the stuffed cardboard tubes close to the stove, and remove the cupcake pan from the oven (using an oven mitt). 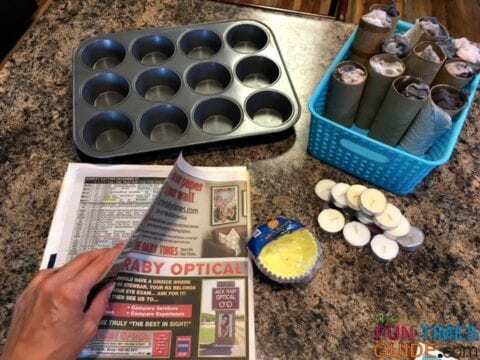 Be mindful of this next step dealing with the hot wax and hot cupcake pan… Slide the wick to the side of the cupcake liner, and place a newspaper-wrapped tube into the hot wax — so it sits vertical with the wick exposed at the bottom of the side of tube. Repeat until all the stuffed tubes are sitting in the wax with wicks sticking out the sides. I keep my “ready to burn” DIY fire starters in a shoe box with a lid. I also keep a lighter inside the box — that way, everything I need to start a fire is always easily accessible. Before starting any fire, I always check to see if there is a burn ban or if I need a fire permit. In our county, fire permits are easily obtained online and are only required for certain times of the year. I don’t bother trying to light a fire if conditions are wet and/or I don’t have any additional dry tinder to help fuel the flame. I have a tutorial for making pine cone fire starters which also work great for starting a fire quickly. But I tend to give those away as gifts — because they smell great, are super cute, and take a little more effort to make. These dryer lint fire starters have been really helpful whenever I’ve wanted to start a fire fast …and easy! Hope you found this dryer lint fire starting tip useful. Always remember to burn responsibly.